Solar Art installed 3M vinyl graphics to a university in San Diego, California! The university was looking for a wall mural in the entry of their science building. They weren’t sure what they were looking for exactly, so they worked with our in house graphics team to create this masterpiece! They did however know they wanted something that would catch people’s attention when they entered the building. 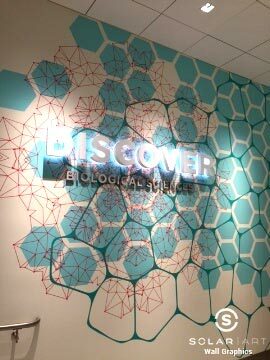 We installed 3M Opaque vinyl graphics to the wall. This particular graphic was installed in three different layers in different phases. The university then had the sign installed on top once the installation was completed. 3M vinyl wall graphics are like window graphics where you have the flexibility to design exactly what you are looking for. Our in house graphics team can produce a custom piece of artwork or an already designed graphic. If you aren't 100% sure of what you want, our team can help you decide which material is best for your installation and how to best move forward to create exactly what you are looking for. Just like solar film, anti graffiti film, security window film and decorative window film, wall graphics are not permanent and can be removed from the wall if you would like. If you are having window graphics installed, they will block 99% of UVA and UVB rays and reduce heat and glare in the space. Solar Art frequently installs 3M vinyl wall graphics in office spaces such as conference rooms, break rooms and even private offices to promote company culture, company values, your mission statement or even something as simple as a favorite travel destination. We have installed wall murals to homes as well! They work great in home offices, game rooms and kids rooms to create constant fun for years to come! The options are really limitless when it comes to custom graphics, speak with a representative at Solar Art to learn more! Interested in Vinyl Wall Graphics? Contact us directly to talk about vinyl wall graphics! With vinyl wall graphics you can create any design you are looking for, for both residential and commercial setting! Work with our in house graphics team to produce the perfect graphic for your space. Contact Solar Art to learn more!